LandOne Takeoff sells innovative software that reduces time and increases accuracy of bid “takeoffs” from landscaping plans. The new business targets small and medium-sized landscape contractors across the USA. Landscaping contractors face a common problem. They need to quickly and accurately take off material quantities from landscape design plans, using the information to bid on new projects. Because most takeoffs are performed manually, turnaround times can be long and mistakes can be costly. When LandOne’s founder, Joshua Martin, began working for a large landscaping contractor, he quickly found that the manual takeoff process for an average commercial project took more than 6-8 hours. Generic construction estimating software was expensive and not tailored to the landscaping industry. 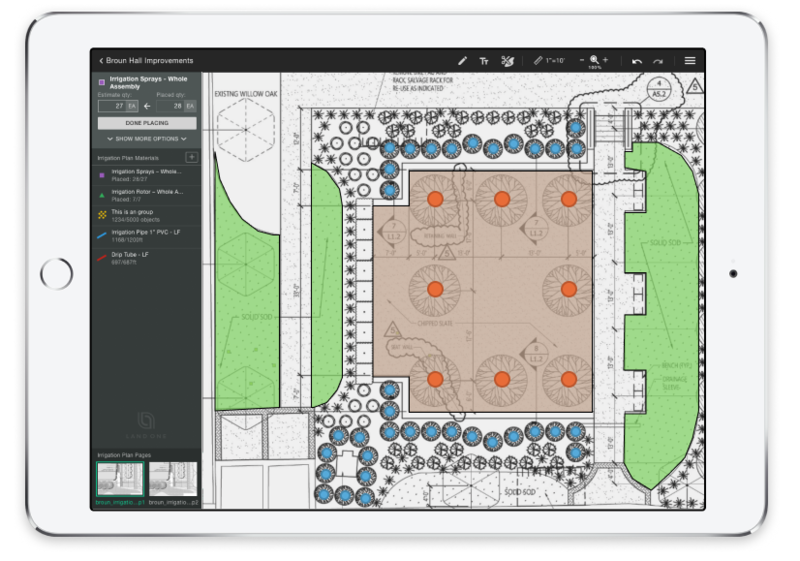 There was a clear need for software that would accelerate the takeoff process and could be sold at a price that fit the budget of a small landscape contractor. Joshua began searching for custom software developers. He found RoleModel Software online and saw how RoleModel had helped decks.com (read case study) create custom software for their customers which let them generate takeoffs in a similar way in a different industry. After an initial consultation, RoleModel recommended starting with a Planning & Exploration (P&E) exercise. The typical P&E identifies key challenges, prioritizes features, and produces a product development roadmap in about 2-3 weeks. However, for this specific project, RoleModel recommended using its Construction Designer framework as a part of the P&E. This approach would jumpstart development and create useful software faster. The team had experienced this acceleration with other clients, and it seemed a perfect fit here. To start the P&E, RoleModel deployed a seasoned team led by a Software Craftsman and a Design Craftsman, who were backed up by the deep technical and business experience of the entire company. Leveraging Construction Designer allowed the team to create an end-to-end prototype or “walking skeleton” where the user could upload a landscape plan, annotate the landscaping elements to produce an accurate count, and download a revised PDF. In less than a month, the P&E was complete and Joshua began using the software in his business. Now that Joshua had a working proof of concept, he was ready to engage early customers and begin fleshing out a product that landscapers would pay for. Rolemodel moved to the first step of the product roadmap—building a Minimum Viable Product (MVP). As with all RoleModel projects, the team used Agile development practices such as short development cycles and an intense focus on user needs to reduce total software cost and the risk of project failure. Four months later, the team had moved the application beyond an MVP to a fully-functional product. Joshua successfully exhibited the software at the 2018 Gulf States Horticultural Expo to rave reviews and strong customer interest. Users report a 50-75% time savings on their takeoffs and Joshua is actively marketing the product.